This recipe is inspired in one of the dishes performed in the book: Working the plate from Christopher Styler. I got it as a present from Susan’s Blogiversary Dash. I was lucky enough to have my name picked from the bowl. It’s a beautiful book with great tricks, pictures and tips to make your plate look nice :D.
Go and visit Sticky Gooey Creamy Chewy, she’s got the most delicious recipes!!!! You can also have it as a tapa… a colourful one, maybe you would prefer to have the hearts of the artichokes only… play around with the recipe and the sauces, a romesco would be great here too! This time, I boiled the artichokes and picked a green sauce for the dressing. The original recipe had an herbed Mayonnaise which is also a fantastic pick. Ingredients for 4 servings: 16 artichokes, 16 fresh shrimps (or frozen if they are good enough. If you choose this possibility, a good sign of high quality is seeing large and not broken whiskers), a bunch of fresh parsley, 4 garlic cloves, olive oil (0,4º), salt and sea thick salt. 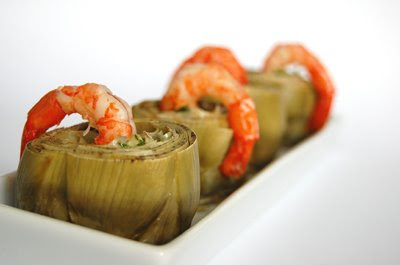 Clean and take away the greener leaves of the artichokes and rub them with a lemon to avoid oxidation. Boil or Roast them until tender. I boiled them in salty water with some olive oil inside their hearts and some salt too. When tender, reserve. In a sauce pan, fry the shrimps with a generous amount of olive oil. Sprinkle with some salt, 30 seconds each side is enough. Reserve them aside and use that oil to make the sauce. Peel and chop the garlics and throw in the pan, turn heat low and when fragrant add the chopped parsley. Stir for some seconds and reserve. Peel the shrimps and if fresh squeeze their heads’ juices inside the green sauce. Stir the sauce and add more olive oil if you feel it necessary. 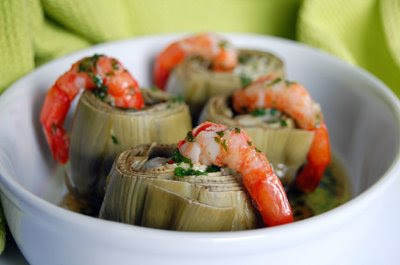 Present the plate with the artichokes, the peeled shrimp half in, the green sauce on top and inside the artichoke and sprinkle with some sea salt. Nuria, the plating is gorgeous and I luv both artichokes and shrimp. I think this would make a nice Tapas or Meze…sharing is always encouraged at the table. Hola Peter! Are we all alone in the Blogosphere today? No turkey on your table? Boy, come join me with this tapa!!!! 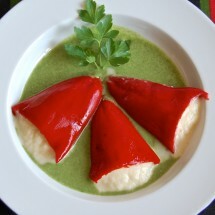 Wonderful recipe, beautiful presentation, perfect photography… need I say more? Amazing! I have some of the baby artichokes in my fridge just calling me!!!!! Hola Jen! I bet your turkey was super!!!! Oh I love artichokes! I especially love the baby wild ones, those I roast over hot coals. A little kosher salt sprinkled over, and it’s a feast! However, they would be devine with this filling, would’nt they? I love artichokes, I love shrimp. This dish pretty much has my name written all over it! Thanks for sharing such a great appetizer! I love artichokes but I hate peeling them. 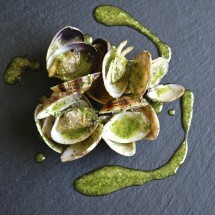 The dish sounds fantastic and your photos are great Nuria. Beautiful to look at and made up of wonderful flavors – this is such a great idea! 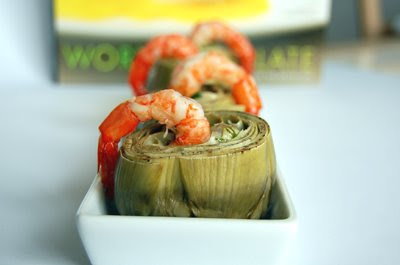 I like the idea of the artichoke filled with tasty green sauce that you can dip the shrimp into. It’s an impressive dish! 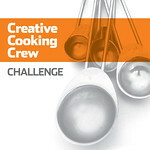 Thanks for the link to Sticky, Gooey, Creamy, Chewy (what a great name) – it’s an intersting blog. Hola Ivy! Yeah, I know what you mean… fingers get dark when peeling them… but for me, it’s so worth… I like them too much! Thanks so much for your encouragement Laurie!!! I wonder if you find local artichokes in Alaska :D.
Thanks so much Maria!!!! 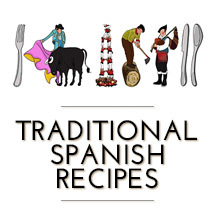 And welcome to Spanish Recipes :D. You are so kind, I really appreciate that :D.
Oh, the shrimp and artichokes look delicious! I love the presentation. 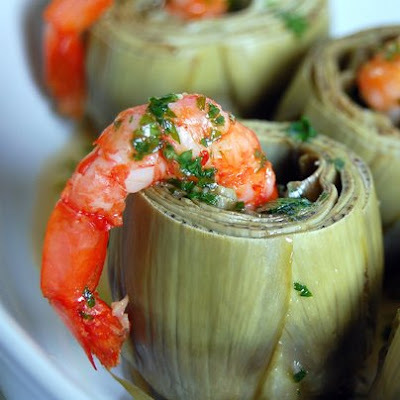 I love shrimp and I love artichokes (I like the hearts best), so I know I would love this dish as a tapa or in a whole meal. And your photos are gorgeous! What a stunning presentation! I love these flavors of the shrimp and artichoke. 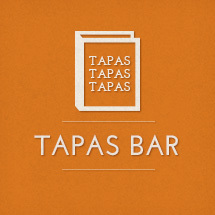 Stunning stunning pictures…& the tapas looks far out. I’ve just discovered my love for prawns…these are singing to me! Seeing this and the artichoke nest makes me wish I had more access to artichokes. What gorgeous presentation. Perfect for entertaining! Hi.. just drop by from DMBLGIT Dec 2008 gallery. Love your photo, the styling is just perfect. I’ve been once in Barcelona and I’d love to go there again. Barcelona is really beautiful.